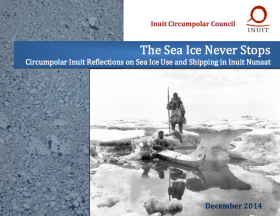 This report from the Inuit Circumpolar Council (ICC), published in December 2014, contributes to the ongoing work of the Sustainable Development Working Group and the Protection of the Arctic Marine Environment working groups of the Arctic Council. It is the product of an ongoing contribution to the Arctic Marine Shipping Assessment (AMSA) conducted by the Arctic Council. An earlier scoping report, The Sea Ice is Our Highway: An Inuit Perspective on Transportation in the Arctic, was produced in March 2008 to provide the authors of the AMSA with an Inuit perspective on the human dimension of shipping. Due to resource and time limitations, the earlier work focused on interviews within Canada. This publication updates and expands the content of this earlier report, and looks at existing sources of information regarding land use and occupancy to understand sea ice use, augmenting this with responses from interviews with Inuit hunters from Canada, Alaska, Greenland, and Chukotka (Russia) to provide a pan-Inuit perspective. It includes general predictions about the future in light of climate change and reduced sea ice based on the experience and traditional knowledge of Inuit hunters.